Mol. Cells. Mar 31, 2018; 41(3): 179-187. Proteomic analysis of extracellular vesicles (EVs) from biological fluid is a powerful approach to discover potential biomarkers for human diseases including cancers, as EV secreted to biological fluids are originated from the affected tissue. In order to investigate significant molecules related to the pathogenesis of bladder cancer, EVs were isolated from patient urine which was analyzed by mass spectrometry based proteomics. Comparison of the EV proteome to the whole urine proteome demonstrated an increased number of protein identification in EV. Comparative MS analyses of urinary EV from control subjects and bladder cancer patients identified a total of 1,222 proteins. 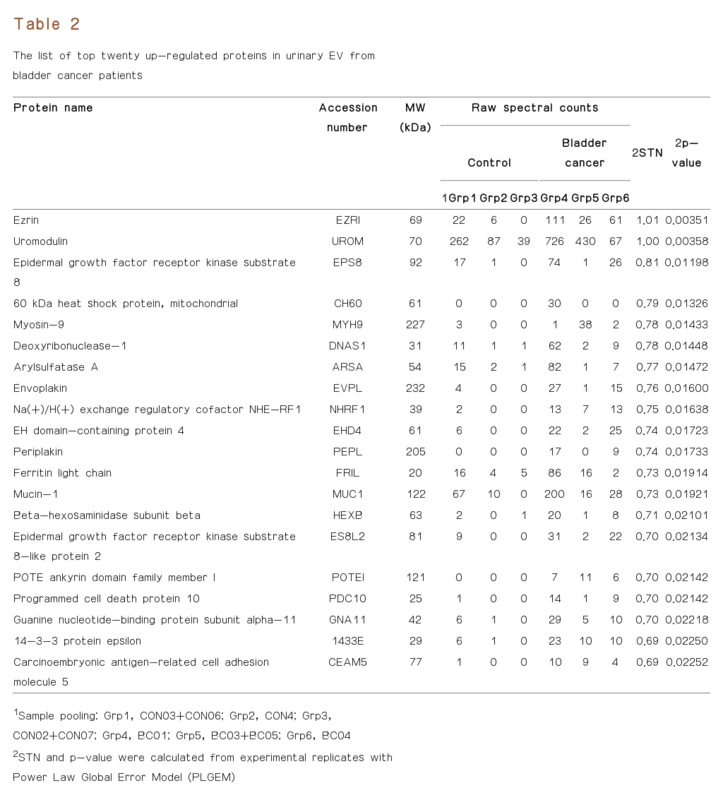 Statistical analyses provided 56 proteins significantly increased in bladder cancer urine, including proteins for which expression levels varied by cancer stage (P-value < 0.05). While urine represents a valuable, noninvasive specimen for biomarker discovery in urologic cancers, there is a high degree of intra- and inter-individual variability in urine samples. 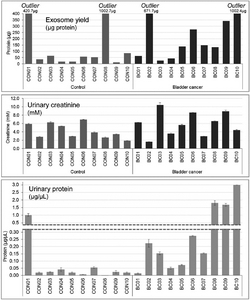 The enrichment of urinary EV demonstrated its capability and applicability of providing a focused identification of biologically relevant proteins in urological diseases. Extracellular vesicles (EV) has been known as membrane bound vesicles secreted by nearly all cell types. Found in most types of bodily fluids, these vesicles, approximately 40–150 nm in diameter, contain proteins and nucleic acids that are characteristic of the cell type in which they originated (Mathivanan and Simpson, 2009). Recently, EV has become more widely studied due to their ability to provide a source of minimally-invasive or non-invasive specimens for the study of diseases and disease processes. Once enriched from biological samples such as plasma or urine, the proteins and nucleic acids within the EV can be identified and quantified using current-omics strategies. In the study of cancer, EV secreted by cancer cells has been shown to contain biologically active proteins. For example, transfer of bladder cancer cell derived EV into urothelial cell culture has been demonstrated to trigger epithelial to mesenchymal transition (EMT) within the target cells (Franzen et al., 2015), a process associated with phenotypic changes that ultimately lead to cancer cell migration, invasion and metastasis. Furthermore, bladder cancer derived EV have been shown to block apoptosis of cancer cells in vitro (Yang et al., 2013), and to promote angiogenesis and cellular migration (Beckham et al., 2014). These observations demonstrate that not only do EV have the potential to signal the presence of cancer cells, they also represent a means by which cancer progression occurs. By further exploring the biological cargo of these vesicles, a better understanding may emerge regarding the proteins employed by the cancer cells for propagation. At the same time, this understanding can lead to the development of therapeutic targets which can be used to thwart the cancer progression and to circumnavigate the cancer’s defense mechanisms which allow it to evade the body’s natural response to aberrant cell growth. Both the potential wealth of diagnostic and prognostic information and the non-invasive nature of isolating EV make them a perfect source for the identification of cancer specific biomarkers. While urine theoretically represents an excellent source of protein biomarkers for urologic cancers such as bladder, kidney and prostate cancers, there is a high degree of intra-and inter-individual variability in urine specimens (Wood et al., 2013). Included in these challenges is variability in the dynamic range of proteins present in urine. We hypothesized that enrichment of urinary EV would reduce variability across samples and provide a more sharply focused field of observation for the identification of biologically relevant proteins in bladder cancer. In this study, urine EV from bladder cancer patients was isolated. 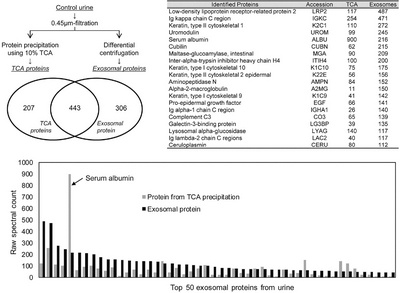 After careful characterizationof EV, the protein contents were identified using mass spectrometry based proteomics strategies, then compared to the urinary EV proteins of healthy control subjects. Of the 1,222 proteins identified, proteins significantly upregulated in bladder cancer EV were selected for orthogonal validation strategies. Water, acetonitrile, methanol and formic acid (FA) of LC-MS grade were purchased from EMD Millipore (Billerica, USA). SDS-PAGE gels (10% Bis-Tris NuPAGE) for protein separation were obtained from Life Technologies (USA) and sequencing grade modified trypsin was from Promega (USA). Complete protease inhibitor cocktail tablets were obtained from Roche (Germany). Ammonium bicarbonate, ammonium acetate, DTT, iodoacetamide, Tris-HCl, bromophenol blue, β-mercaptoethanol, Tween-20 and SDS were obtained from Sigma (USA). Glycerol was from Life Technologies (USA). All buffers and solutions were prepared using deionized water by Milli-Q, Millipore (USA). Unless stated otherwise, all other chemicals were extra-pure grade or cell culture tested. Twenty human urine specimens (100 ml for each male donor) were purchased from Bioreclamation IVT (USA) for this study. Individual donor demographics are shown in Table 1. After thawing, creatinine content was measured using a triple quadrupole mass spectrometer by methodology reported previously (Larion et al., 2013). Urinary protein level was also measured using bicinchoninic acid (BCA) assay. Due to the limited amount of test specimens, blank urine samples from two of healthy volunteers (36 and 41 for the age) without disease diagnosis were used for method development and optimization. First urine in the morning was collected, then frozen in −80°C for at least 24 h prior to EV preparation to mimic the storage condition of test specimens. EV were prepared using a differential centrifugation method reported previously with minor modifications (Lee et al., 2016; Watts et al., 2012). In detail, frozen urine samples were placed in 4°C until they were thawed completely. The 50 ml of urine was centrifuged at 2,000 × g for 10 min to eliminate particles and debris, then the supernatant was filtered with 0.45 μm PVDF membrane followed by centrifugation at 18,000 × g for 30 min. Supernatant was transferred to a clean tube and centrifuged at 200,000 × g for 16 h using Beckman SW-40 Ti rotor (USA). Pellets were washed with cold 0.22 μm filtered PBS by re-suspension followed by additional centrifugation at 200,000 × g for 1 h. The final pellet was dissolved with cold, 0.22 μm filtered PBS containing protease inhibitor cocktail to generate an intact EV suspension (Fig. 1). 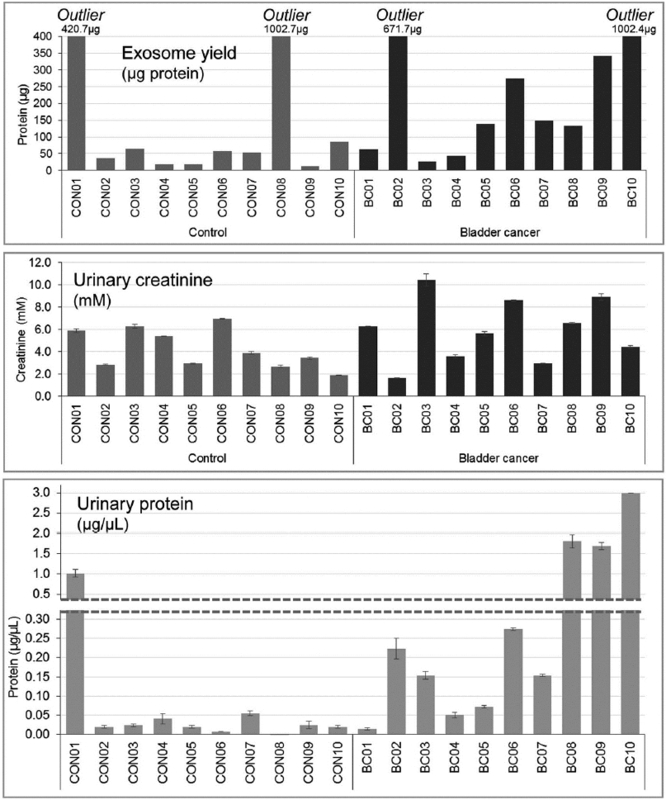 (A) A graphical workflow of EV protein profiling of bladder cancer urine (B) Urinary EVs were isolated employing differential centrifugation. 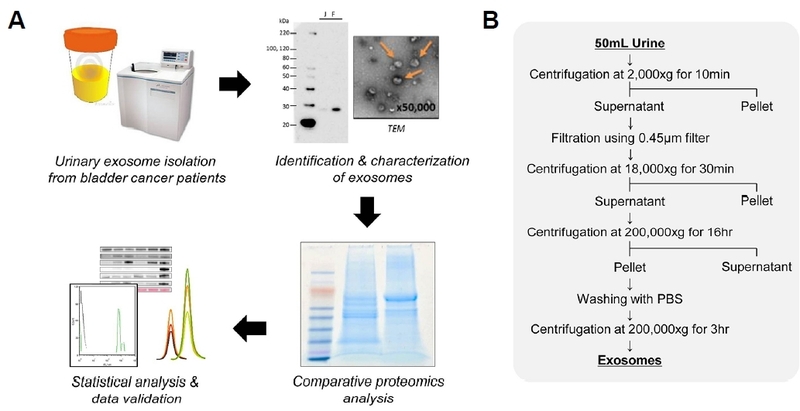 Isolated exosome was characterized mainly using transmission electron microscopy (TEM), fluorescence-activated cell sorting (FACS) with flow cytometry and western blot analysis. A PBS suspension of exosome was mixed with the same volume of 4% paraformaldehyde for fixation, which was loaded onto a sample grid for TEM analysis. For FACS, 10 μg of intact exosome were coupled with 1 μl of aldehyde/sulfate latex beads suspension (4% w/v, 4 μm) purchased from Life Technologies (USA) by overnight incubation at 4°C. Coupled beads were pelleted, which were then suspended in permeabilization buffer consisted of 0.1% triton X-100 in FACS buffer (0.5× PBS with 0.05% BSA) followed by 1 h incubation at room temperature. After 2 times washing with FACS buffer, primary antibody was added and incubated 1 h at room temperature. After washing with FACS buffer, coupled beads were incubated with fluorescent secondary antibody for 30 min at room temperature, then washed twice. After resuspension in FACS buffer, beads were measured by FACSAria II from BD Biosciences (USA). The external diameter of exosome and its population was measured with PBS suspension of intact exosome employing nanoparticle tracking analysis (NTA) using Nano Sight NS500 (Malvern Instruments, UK). The PBS suspension of EV was mixed with an equal volume 2× radioimmunoprecipitation (RIPA) buffer for the lysis, which were then separated by SDS-PAGE and subjected to in-gel tryptic digestion for proteomics analysis. Samples that showed higher protein yield (> 400 μg) were excluded from proteomics analysis at this stage. Furthermore, certain samples with uncharacteristic gel banding patterns or with thick interfering protein bands were also excluded. For samples requiring pooling to achieve desired protein amounts, equal amounts of protein were used from the two samples making up the pooled sample. Three samples of each control and bladder cancer were prepared, then subjected to tryptic in-gel digestion. First, 10 μg of denatured proteins were separated on 10% Bis-Tris NuPAGE gels. Proteins were visualized by Coomassie staining with GelCode Blue staining reagent (Thermo Scientific, USA), and each gel lane was cut into 5 slices, which were in turn, cut into small pieces. Gel pieces were destained with 50% (v/v) acetonitrile (ACN) containing 25 mM ammonium bicarbonate (ABC) several times, and then were dehydrated in 100% ACN. After being vacuum dried via centrifugation using a Centrivap, (Labconco, USA), gel pieces were rehydrated in 50 mM ABC containing 12.5 ng/μl trypsin, and then incubated at 37°C overnight. Peptides were extracted 3 times by adding 100 μl 50% (v/v) ACN containing 5% (v/v) formic acid and incubated at room temperature for 30 min. The extracts were vacuum dried by centrifugation again and then were suspended in 5% (v/v) ACN containing 3% (v/v) formic acid to be analyzed by LC-MS/MS. The LC-MS/MS system used consisted of an LTQ/Orbitrap-XL mass spectrometer (Thermo Scientific, USA) equipped with Nanoacquity UPLC system (Waters, USA). Peptides were separated on a Nanoacquity trap column (C18, 5 μm, 100 Å, 180 μm ID × 20 mm, Waters, USA) combined with a reversed phase analytical column (Nanoacquity BEH C18, 1.7 μm, 250 mm, Waters, USA). Peptides were separated using a 180 min linear gradient consisting of mobile phases solvent A (0.1% formic acid in water) and solvent B (0.1 % formic acid in ACN) where the gradient was from 2% B at 0 minutes to 35% B at 155 min. MS spectra were acquired by data dependent scans consisting of MS/MS scans of the ten most intense ions from the full MS scan with dynamic exclusion of 30 s.
The annotated human protein database from UniProtKB (20,161 entries, date; 10-1-2014) was used within Proteome Discoverer analytical software (v1.4, Thermo Scientific, USA) applying the generic SEQUEST search algorithm. Search parameters were as follows: parent mass tolerance of 20 ppm, fragment mass tolerance of 0.8 Da (monoisotopic), variable modification on methionine of 16 Da (oxidation) and maximum missed cleavage of 2 sites using the digestion enzyme trypsin. The identified peptides were validated employing a decoy database search algorithm. The files generated from Proteome Discoverer (.msf) were compiled using Scaffold software (v4.0.5, Proteome Software, USA), which provided spectral counts for data comparison under the following filter criteria: 99.0% of protein/peptide thresholds in combination with SEQUEST score (XCorr, score versus charge state). XCorr scores were greater than 1.5, 2, and 3 for singly, doubly and triply charged peptides and deltaCn scores were greater than 0.10. Shared and partial-tryptic peptides were excluded from spectral counts for both search algorithms. Protein probability and redundancy were assigned by the Protein Prophet algorithm. Proteins that contained similar peptides and multiple isoforms that could not be differentiated based on MS/MS spectra were grouped into primarily assigned proteins. Spectral counts from the analyses of three control samples and three disease samples were compared statistically using the Power Law Global Error Model (PLGEM) in order to obtain STN (signal-to-noise ratio), which represents protein expression changes at specific p-values to identify protein alteration in bladder cancer (Pavelka et al., 2004). Proteomics data was validated employing western blot analysis with antibodies against selected proteins such as mucin-1, carcinoembryonic antigen-related cell adhesion molecules-5 (CEACAM-5), Epidermal growth factor receptor kinase substrate 8-like protein 2 (EPS8L2) and moesin which were shown to be overexpressed in EV from bladder cancer patient group. Antibodies which were used for western blot and flow cytometry are as follow; anti-human CD63 (clone H5C6, mouse monoclonal, BD Biosciences, USA), anti-human TSG101 (clone EPR7130(B), rabbit monoclonal, Millipore, USA), anti-human flotillin-1 (Clone 18/Flotillin-1, mouse polyclonal, BD Biosciences, USA), anti-human HSP70 (clone W27, mouse monoclonal, BioLegend, USA) and anti-human Alix (clone 3A9, mouse polyclonal, Cell Signaling, USA). In order to optimize the isolation strategy prior to utilization of limited patient samples, we tested the approach using blank urine from healthy, de-identified donors. EV was identified and characterized primarily by visualization using TEM and NTA displayed their morphological features such as shape and size (Figs. 2A and 2B). Alix, a member of representative EV proteins was observed by FACS analysis (Fig. 2C), which was also validated by western blot analysis by showing a band at ~95kDa. Positive expressions of other EV markers, namely CD63, tumor susceptibility gene 101 (TSG101) protein, flotillin-1 and heat shock protein-70 (HSP70) were visualized by bands appeared at 54 kDa, 45 kDa, 48 kDa and 70 kDa respectively from the same membrane with sequential blotting (Fig. 2D). The test EV from control urine was then subjected to proteomics analysis for the comparison of protein profile with that of crude protein fraction acquired from 10% TCA precipitation of the same control urine. As shown in Fig. 3A, EV fraction was superior to precipitated fraction in identification number with over 30% of unique proteins out of total proteins identified. Also, the uniqueness of its proteome profile is visualized by a table with spectral counts of top-20 proteins as well as a bar graph acquired from direct comparison with precipitated protein, display huge discrepancy in terms of protein pattern (Fig. 3, Supplementary Table S1). Figure 4 shows paraclinical parameters and EV yield of urine samples participated in this study. When EV yield was compared to creatinine and protein level, no positive correlation was examined (Fig. 4). Four subjects which showed extraordinary EV yields (420.7-1002.7 μg) were excluded from proteomics analysis, suspected to be from individuals with hematuria judging from the urine color. Mass spectrometric analysis was conducted on pooled specimens from each group and 1,222 total proteins were identified with high confidence. Spectral count data was analyzed using PLGEM to generate STN values indicative of statistically significant differences between cancer and healthy donor urinary EV ( Supplementary Table S2). At the p < 0.05 level, 56 proteins were shown to be significantly upregulated in bladder cancer. Top-20 upregulated proteins are shown in Table 2 and four proteins were selected for further validation with western blot analysis (Fig. 5). 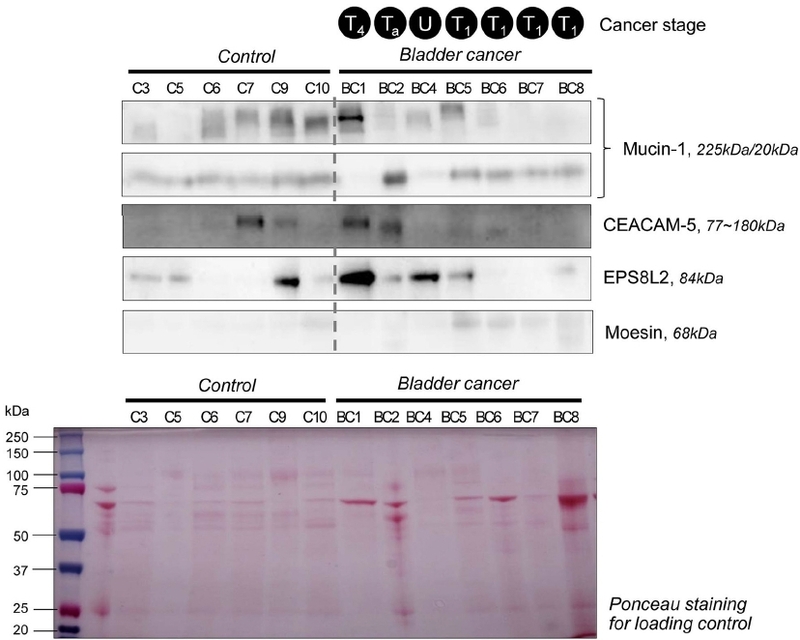 The Western blot analysis of identified molecules from comparative proteomics showed differentiated expression levels by cancer stage. Recently, EV proteome profiling in human cerebrospinal fluid (CSF) has been performed to report a set of molecular marker candidates capable of discrimination of two neuronal inflammatory diseases, multiple sclerosis (MS) and neuromyelitis optica (NMO) by our group (Lee et al., 2016). Finding of these significant molecules has proved our hypothesis that EV proteome changes may reflect pathological status by its significant roles on cellular connectivity as well as cellular trafficking. In this study, methodology for urinary EV isolation has been optimized using blank urine samples, having sizes consistent with EV primarily in the 100–120 nm diameter range. TEM, FACS and western blot analysis targeting common EV markers including Alix, CD63, TSG101, Flotillin-1 and HSP70 supported the optimized isolation procedure for purification of intact EV from the urine of human subjects. Urine has been utilized for the detection of biomarkers of many diseases, and despite high levels of inter-sample variation, has been suggested as a non-invasive source of bladder cancer biomarkers (Frantzi et al., 2015). Furthermore, The higher quantity of EVs from metastatic cancer than that from the control was reported by several references (Kalluri, 2016; King et al., 2012). To determine whether an advantage exists in using urinary EV instead of whole urine for cancer biomarker identification, we compared the proteomic profile of whole urine to the EV fraction from the urine of healthy control subjects. As seen in Fig. 3, while there was a considerable overlap in proteins identified between the two sample sources, nearly 100 more proteins were confidently identified from the EV sample. In addition, these results demonstrated a profound decrease in the level of albumin protein present in the samples. Albumin and other highly abundant proteins endogenous to biological samples are known to mask the identification of lower abundance proteins in mass spectrometry based proteomics approaches. It is possible that the reduction of albumin may directly result in the higher number of identifications seen in the EV sample. Regardless, the increase in the number of proteins identified and the dramatic reduction in albumin protein indicate a definitive improvement over whole urine for proteomic analysis. Prior to EV isolation for the study, a portion of urine from each subject was analyzed for creatinine concentration and for total protein levels present. Despite variations across all subjects, comparisons of these measurements did not indicate any dramatic increase in creatinine levels as a function of bladder cancer overall. Protein levels did appear to be increased in some, but not all cancer patients, but these increases were most dramatic in individuals with kidney failure or chronic kidney disease (CKD) (Table 1 and Fig. 4). EV isolations generated some dramatic variations in the total EV protein yields across subjects. Of particular note is the fact that overall, cancer patients demonstrated higher EV protein yields. It is unknown why certain subjects within each sample group demonstrated drastically higher EV yields. These subjects were excluded from mass spectrometry analysis as outliers. Since overall protein banding patterns varied for some subjects (data not shown), investigating these dramatic differences within diagnostic boundaries may be the focus of future work. Among the significant proteome with upregulation detected by proteomics analysis, four proteins, namely mucin-1 (MUC1), carcinoembryonic antigen (CEA), epidermal Growth factor receptor kinase substrate 8-like protein 2 (EPS8L2), and moesin were selected for western blot as further validation and the selection was performed by considering the degree of changes and their roles in pathology of cancer development and progression. MUC1 is a glycoprotein which exists mainly on the epithelial cell surface and is involved in signal transduction and cellular adhesion. MUC1 has been implicated in the pathogenesis of many cancers and is believed to exert its influence via signaling pathways including beta catenin and cyclin D1. It has been shown to contribute to NK cell evasion (Suzuki et al., 2012), and MUC1 expression has recently been associated with prognosis in bladder cancer as a function of epidermal growth factor receptor expression levels (Nielsen et al., 2015). In our study, MUC1 was dramatically over expressed in bladder cancer samples by mass spectrometry analysis. As shown in Fig. 5, Western blot analysis did show stage 4 cancer to over express MUC1. However, the findings for earlier stages were inconclusive, with certain control samples demonstrating a higher degree of MUC1 expression in comparison. CEA is another surface glycoprotein encoded by the CEACAM-5 gene. This protein has been associated with tumor angiogenesis and has been detected in circulation in the blood of cancer patients (Bramswig et al., 2013). Furthermore, it has been shown to affect immune system evasion by inhibiting NK cell targeting of cancer cells (Stern et al., 2005). While increased CEA expression indicated by MS analysis was moderate, western blot upregulation was ambiguous, with diffuse bands in most cancer samples, but discrete bands in two of the seven samples tested. At least two of the seven control samples also demonstrated elevated expression of CEA. EPS8L2 was also moderately upregulated by MS analysis. In Western blot, EPS8L2 appeared most consistently increased in four of seven cancer EV samples, but only one control sample. Increased expression of EPS8L2 has recently been associated with endometrial cancer (Colas et al., 2011), however no associations with bladder cancer have been reported to date. Moesin is a component of the ezrin-radixin-moesin (ERM) protein family. These proteins have been associated with metastasis and poor prognosis in a number of different cancers including pancreatic, colon and laryngeal carcinomas (Adada et al., 2015; Jiang et al., 2014; Piao et al., 2015; Wang et al., 2014). While ezrin was statistically the most highly upregulated protein in our data set, we selected moesin for further validation of our data set. With no appreciable expression on western blot for control samples, only faint expression of moesin was detected in four of seven cancer samples, all of which were early stage. Overall the markers that were selected for validation were shown to be directly associated with metastasis, either through adhesion/invasion pathways or through immune system evasion actions, or both. This is consistent with the idea that EV cargo is packaged by cancer cells and transported via secretion and circulation to local or distant sites in order to prepare a receptive microenvironment for the invasion of cancer cells. However, inconsistencies exist in our western blot data. As shown in Fig. 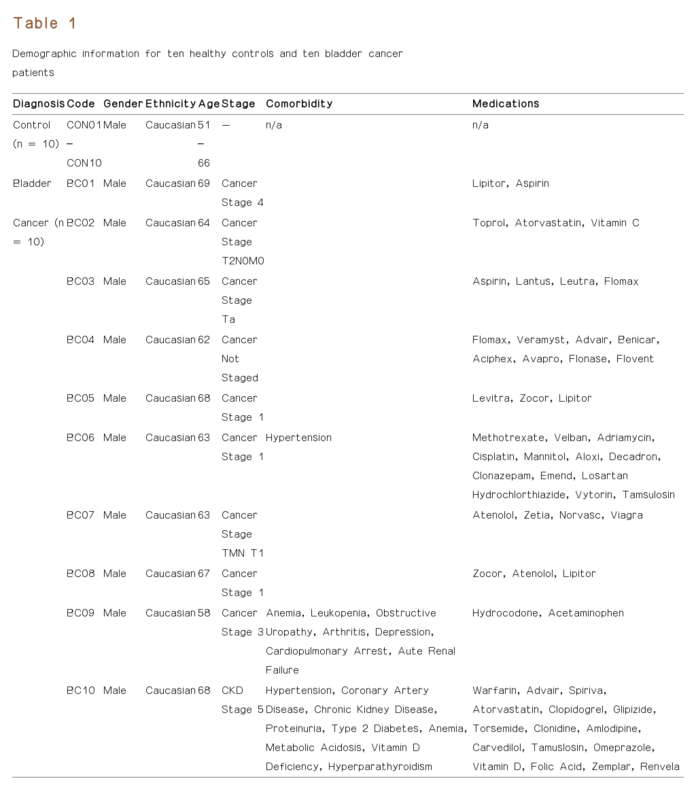 5, control sample C9 consistently overexpresses 3 of the 4 potential cancer markers. In our sample set, controls were deemed healthy donors. However, due to the fact that these samples are de-identified, the possibility does exist that this subject was suffering from an undiagnosed malignancy. Nevertheless, there still remains a high degree of variability of protein expression across the different subjects within both control and cancer classifications. In this study we investigated the applicability of urine EV as a means by which urine samples can be optimized for proteomic profiling and identification of bladder cancer biomarkers. We demonstrated an optimized workflow for the isolation of purified, intact EV from the urine of human subjects. Furthermore, we demonstrated an improvement in the number of proteins identified in urine EV versus whole urine. However, dramatic variations existed between the protein yields and expression levels of selected proteins between individuals without cancer as well as individuals with cancer. While some differences in protein expression levels may be attributed to cancer stage, this is not demonstrated consistently in our sample set. Overall, urine EV have the potential to provide an enriched source of important biological information regarding cancer status and mechanisms of progression. However, for diagnostic or prognostic purposes, more work is needed to characterize and reduce inter- and intra-individual variations that remain a challenge in the use of urine for cancer biomarker identification. Mol. Cells.Mar 31, 2018; 41(3): 179-187. Received June 30, 2017; Accepted December 20, 2017. Adada, MM, Canals, D, Jeong, N, Kelkar, AD, Hernandez-Corbacho, M, Pulkoski-Gross, MJ, Donaldson, JC, Hannun, YA, and Obeid, LM (2015). Intracellular sphingosine kinase 2-derived sphingosine-1-phosphate mediates epidermal growth factor-induced ezrin-radixin-moesin phosphorylation and cancer cell invasion. FASEB J. 29, 4654-4669. Beckham, CJ, Olsen, J, Yin, PN, Wu, CH, Ting, HJ, Hagen, FK, Scosyrev, E, Messing, EM, and Lee, YF (2014). Bladder cancer exosomes contain EDIL-3/Del1 and facilitate cancer progression. J Urol. 192, 583-592. Bramswig, KH, Poettler, M, Unseld, M, Wrba, F, Uhrin, P, Zimmermann, W, Zielinski, CC, and Prager, GW (2013). Soluble carcinoembryonic antigen activates endothelial cells and tumor angiogenesis. Cancer Res. 73, 6584-6596. Colas, E, Perez, C, Cabrera, S, Pedrola, N, Monge, M, Castellvi, J, Eyzaguirre, F, Gregorio, J, Ruiz, A, and Llaurado, M (2011). Molecular markers of endometrial carcinoma detected in uterine aspirates. Int J Cancer. 129, 2435-2444. Frantzi, M, Latosinska, A, Fluhe, L, Hupe, MC, Critselis, E, Kramer, MW, Merseburger, AS, Mischak, H, and Vlahou, A (2015). Developing proteomic biomarkers for bladder cancer: towards clinical application. Nat Rev Urol. 12, 317-330. Franzen, CA, Blackwell, RH, Todorovic, V, Greco, KA, Foreman, KE, Flanigan, RC, Kuo, PC, and Gupta, GN (2015). Urothelial cells undergo epithelial-to-mesenchymal transition after exposure to muscle invasive bladder cancer exosomes. Oncogenesis. 4, e163. Jiang, L, Phang, JM, Yu, J, Harrop, SJ, Sokolova, AV, Duff, AP, Wilk, KE, Alkhamici, H, Breit, SN, and Valenzuela, SM (2014). CLIC proteins, ezrin, radixin, moesin and the coupling of membranes to the actin cytoskeleton: a smoking gun?. Biochim Biophys Acta. 1838, 643-657. King, HW, Michael, MZ, and Gleadle, JM (2012). Hypoxic enhancement of exosome release by breast cancer cells. BMC Cancer. 12, 421. Kalluri, R (2016). The biology and function of exosomes in cancer. J Clin Invest. 126, 1208-1215. Larion, S, Caballes, FR, Hwang, SI, Lee, JG, Rossman, WE, Parsons, J, Steuerwald, N, Li, T, Maddukuri, V, and Groseclose, G (2013). Circadian rhythms in acute intermittent porphyria--a pilot study. Eur J Clin Invest. 43, 727-739. Lee, J, McKinney, KQ, Pavlopoulos, AJ, Han, MH, Kim, SH, Kim, HJ, and Hwang, S (2016). Exosomal proteome analysis of cerebrospinal fluid detects biosignatures of neuromyelitis optica and multiple sclerosis. Clin Chim Acta. 462, 118-126. Mathivanan, S, and Simpson, RJ (2009). ExoCarta: A compendium of exosomal proteins and RNA. Proteomics. 9, 4997-5000. Nielsen, TO, Borre, M, Nexo, E, and Sorensen, BS (2015). Co-expression of HER3 and MUC1 is associated with a favourable prognosis in patients with bladder cancer. BJU Int. 115, 163-165. Pavelka, N, Pelizzola, M, Vizzardelli, C, Capozzoli, M, Splendiani, A, Granucci, F, and Ricciardi-Castagnoli, P (2004). A power law global error model for the identification of differentially expressed genes in microarray data. BMC Bioinformatics. 5, 203. Piao, J, Liu, S, Xu, Y, Wang, C, Lin, Z, Qin, Y, and Liu, S (2015). Ezrin protein overexpression predicts the poor prognosis of pancreatic ductal adenocarcinomas. Exp Mol Pathol. 98, 1-6. Stern, N, Markel, G, Arnon, TI, Gruda, R, Wong, H, Gray-Owen, SD, and Mandelboim, O (2005). Carcinoembryonic antigen (CEA) inhibits NK killing via interaction with CEA-related cell adhesion molecule 1. J Immunol. 174, 6692-6701. Suzuki, Y, Sutoh, M, Hatakeyama, S, Mori, K, Yamamoto, H, Koie, T, Saitoh, H, Yamaya, K, Funyu, T, and Habuchi, T (2012). MUC1 carrying core 2 O-glycans functions as a molecular shield against NK cell attack, promoting bladder tumor metastasis. Int J Oncol. 40, 1831-1838. Wang, Y, Yago, T, Zhang, N, Abdisalaam, S, Alexandrakis, G, Rodgers, W, and McEver, RP (2014). Cytoskeletal regulation of CD44 membrane organization and interactions with E-selectin. J Biol Chem. 289, 35159-35171. Watts, JA, Lee, YY, Gellar, MA, Fulkerson, MB, Hwang, SI, and Kline, JA (2012). Proteomics of microparticles after experimental pulmonary embolism. Thrombosis Res. 130, 122-128. Wood, SL, Knowles, MA, Thompson, D, Selby, PJ, and Banks, RE (2013). 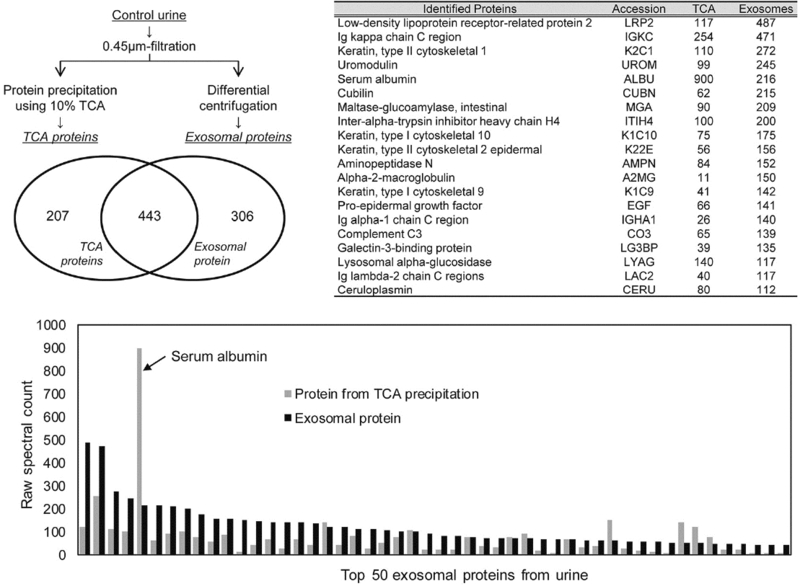 Proteomic studies of urinary biomarkers for prostate, bladder and kidney cancers. Nat Rev Urol. 10, 206-218. Yang, L, Wu, XH, Wang, D, Luo, CL, and Chen, LX (2013). Bladder cancer cell-derived exosomes inhibit tumor cell apoptosis and induce cell proliferation in vitro. Mol Med Rep. 8, 1272-1278.